President & CEO Matthew Reilly reflects on MEND’s 50th anniversary. We are thrilled to launch a year-long celebration for MEND’s 50th anniversary! Much has changed in the last half-century, but one thing has remained the same – our commitment to providing good, decent, hard-working people with a safe and secure place to call home. MEND has always been a true pioneer in addressing the affordable housing needs in the suburbs of southern New Jersey. Back at the time of our founding in 1969, the statewide focus was primarily on the affordable housing needs of downtrodden urban neighborhoods in older inner cities like Newark and Camden. The landmark “Mount Laurel” affordable decision made by the New Jersey Supreme Court in 1975 was still to come. But nine Moorestown church leaders came together when they saw a lack of affordable housing in their community – and look how far we’ve come. When I joined MEND in 2001, the organization had 230 apartment units, all located in Moorestown. We now have 715 units located across eight South Jersey towns. I’m very proud of the enormous growth that MEND has experienced during my tenure. And even as we celebrate the last 50 years, we are looking ahead to what’s next. There are challenges facing MEND and all affordable housing developers, including the ongoing legal battles between affordable housing advocates and the municipalities, and the inadequate funding from all levels of government to put affordable housing in place. Still, MEND is proud to continue our mission. We will expand our presence to nine towns this Fall when we open our new 54-unit senior development in Cinnaminson. And since our housing is always operating at full occupancy, we are always available to partner with any town trying in good faith to meet its affordable housing obligations. None of this growth would be possible without the 15 experienced property management and maintenance professionals who take care of our 27 housing sites. Our employees work hard every day to take care of our properties and tenants. Their jobs require a very special blend of skill, experience, compassion and dedication. I am very proud of the high-quality professional work that my staff does every day. I invite you to join in our 50th anniversary celebration. 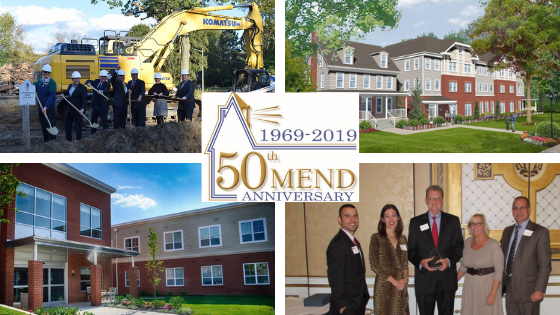 Use #MENDturns50 to join the conversation on LinkedIn, and please consider joining us for upcoming events that support our mission: our Golf Outing on May 10 at Deerwood Country Club and our Golden Anniversary Celebration October 4 at The Merion. MEND is an equal opportunity housing provider. We fully comply with the Federal Fair Housing Act. We do not discriminate against any person because of race, color, religion, gender, handicap, disability, familial status or national origin. We comply with all state and local fair housing laws.